As of this past Monday, March 18, grooming on all trails was suspended. With the ongoing warm weather, sun, and rain over the last week, we have rapidly lost our trail base, creating large stretches of exposed ground and rocks on the trails. Swamps are also opening up in places. Please use caution while riding, especially considering current conditions. The Taconite is in poor condition. The trail base is thin due to warm weather and heavy trail use, and there are many stretches of exposed rock and ground throughout the trail, especially on hills and corners. The spur trail leading from the Taconite to the Oasis Bar and Grill in Britt has been rerouted due to landowner issues. The reroute goes from the Taconite east of Hwy 53 (opposite side from the Oasis) to Peppard Rd, crosses Hwy 53 at the Peppard Rd Jct, and follows the ditch south to Peel Rd and to the Oasis. Putnam/Fishing Lakes Trail – is groomed and in poor condition. Be aware of logging operations on and around the trail shortly after the trail crosses the West Two River trail bridge. Lake Vermilion- Soudan Underground Mine State Park Trail- are in poor condition. Tomahawk Trail – is groomed and in good condition. The entire Arrowhead is in poor condition. The trail base is thin due to warm weather and heavy trail use, and there are many stretches of exposed rock and ground throughout the trail, especially on hills and corners. 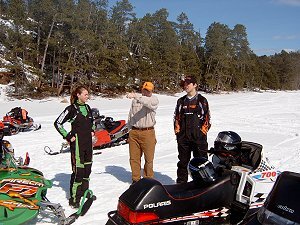 T he Ely area is northern Minnesota’s premier snowmobile hub with numerous on-trail facilities, accommodations for both large and small groups, and with plenty of food, entertainment and service centers. The Taconite Trail is the main thoroughfare in and out of Ely in the winter. Stretching 170 miles between Ely and Grand Rapids to the southwest, many spur routes will take you just about anywhere you want to go. 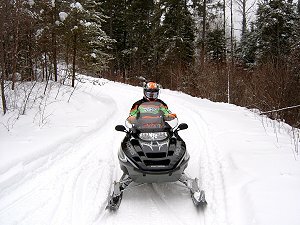 The Tomahawk Trail, heading to the east, has 86 miles of varied terrain which the avid snowmobiler can use to connect up with hundreds of miles more of groomed trails. 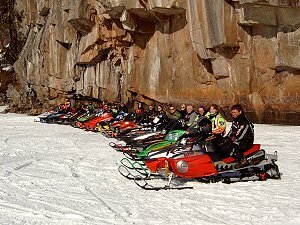 If good snowmobiling gets you excited about winter, then try out the 170 mile long Taconite Trail and the 80 mile Tomahawk Trail. The Taconite Trail, or the “Mighty Taconite” as the locals call it, runs from Ely to Grand Rapids. It stretches across three state forests and the Superior National Forest. Smooth rides along this famous route are loaded with history and the Taconite’s many spurs and loops make for some quality modern day pioneering. The Tomahawk Trail runs from Ely to the North Shore and Yukon Trails. The trail works closely with natural terrain and is one of the most scenic trails in the state. The tree cover that surrounds the trail edges, the lack of traffic and development allows you to have an uninhabited experience.